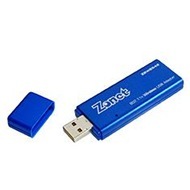 The Zonet ZEW2542 - 802.11N Wireless USB Adapter provides a simple, portable and secure wireless connectivity to laptop or desktop computer. It lets you put your computer almost anywhere in the building without the cost and hassle of running cables. Once you're connected, you can keep in touch with your e-mail; access the Internet, use instant messaging to chat with friends, and share files and other resources such as printers or hard disk storage space with other computers on the network. I’m just downloading and test the driver if it is going to work or not.